So this is the finished thing. 's tatoo... I haven't come up with any proper slogan for the banner yet, so I just put the song title there. This what happens when I'm coloring things the traditional way. Thought it was easier but I was mistaken... aham... blame it on the crappy paper. why do I always see him with a scythe? did you use color pencil? Damn! that is good i can never get pencil to do that.... Just Prismacolor markers. *gasp* From the deleted song surrounding Esmeralda and Phoebus' gypsy marriage in The Court of Miracles. It was a great song, but it just didn't suit the dark tone that the movie was going for. Clopin came out very nice! Excellent job on the coloring and overall picture, you did a fantastic job. Your welcome! 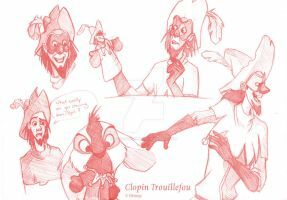 I love how you draw Clopin, you did a fantastic job on him. I love that song. I'd much rather they included it instead of 'A Guy Like You'; that's my least favorite song in the movie. Dito that. But then again: Imagine the ridiculousness of the scene that would have followed. "Oh, right, btw, we came to warn you from Frollo." I imagine the storyline would have been a bit different if they had included that song, maybe entirely different. Temporary? No, "As Long As There's a Moon" fits perfectly, don't change it! Talk about your harvest moon.